"My name is Elizabeth Glass , a member of the Phantom Regiment color guard in '02, '03 and soon to be '05. 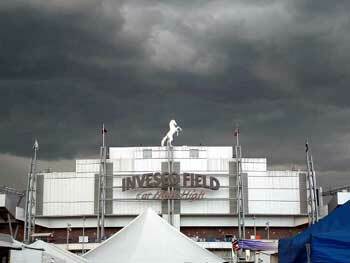 This is a picture from DCI semifinals in 2004 in Denver. It is one of my absolute favorite pictures. And the crazy thing is that an hour later, the sky was clear and semifinals continued on!"